So after a bit of consideration, revaluation, and a healthy dose of courage ... here is my latest shadow box. Of course it did not hurt that Christmas is right around the corner and this is a present for my friend Walt. Now I'm not worried that he will see this ... sad to say hard times means no internet for the Deanovich household So even though he was a faithful reader of this blog ... I feel pretty safe right now. This is definitely a step forward from the last one I did for Allison. No Mickey Mousing it this time . No holding it all together with duct tape and a prayer. 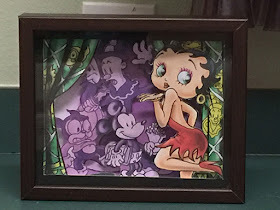 I found a different premade shadow box at Michael's. It fit all of the layers. I used the new larger printer. I made a border to go along the frame but have not found an adhesive that will glue the paper to the composite material. I am still looking for the proper material of paper. This try, when I tried to cut there was a tendency to have raggy edges. More experimentation. 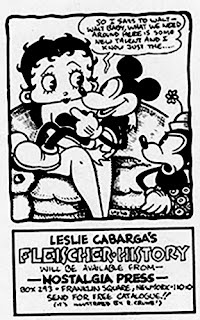 You may of noticed that Mickey is in among the Fleischer characters. Bimbo is about to stab the Mouse, who is where he shouldn't be. The wrong place at the wrong time. Koko the Clown stares in horror at what is about to happen. Betty is ... well boop-a-licious. It's actually an inside joke between Walt and myself. On page 260, in the "A History of Underground Comics, there is an ad for Leslie Carbage's "The Fleischer Story." Both of us have BOTH books and have had more than a few discussions about them. As you can see ... they share common themes. I hope Walt likes this effort. I am happy up to a point. There is ... always room for improvement. And I'm already on it.